This item is part of a Milwaukee Promo that is valid until April 30th. 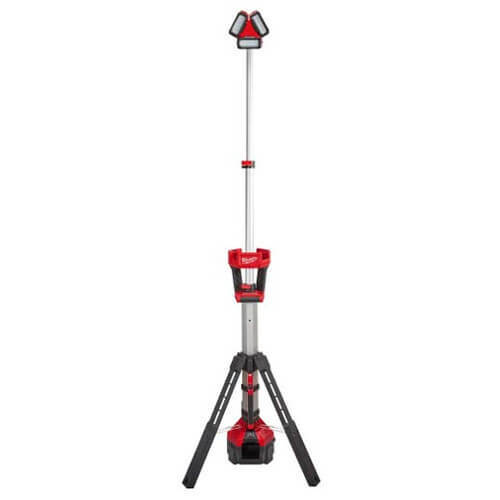 With the purchase of this M18 Rocket Tower Light, you can redeem a FREE M18 Redlithium XC5.0 Extended Capacity Battery Pack from Milwaukee. The M18™ ROCKET™ LED Tower Light/Charger is designed to deliver a lighting solution that adapts, performs, and survives professional use unlike any other portable work light. The 2135-20 can be setup in seconds to a max height of 7’, and collapses to less than 4’ for easy transport and storage. The light head can be extended from 4-7’ to light overhead work or minimize shadows when casting light downward. The multidirectional light head gives users the ability to orient the three independently pivoting light heads to cast light in several directions. With an integrated AC plug, a user can plug in the light with a standard extension cord, and charge any M18 REDLITHIUM™ pack. Delivering 3,000 lumens, it fills up large areas with TRUEVIEW™ High Definition light. For optimized control over the output and run-time, the M18™ ROCKET™ LED Light has three settings: high provides 3,000 lumens at 2+ hours, medium provides 1,700 lumens at 4+ hours, and low provides 900 lumens at 8 hours with a M18 REDLITHIUM™ XC5.0 Battery Pack (not included).